Estate tax repeal: Republicans want to cut taxes for rich dead people, again. 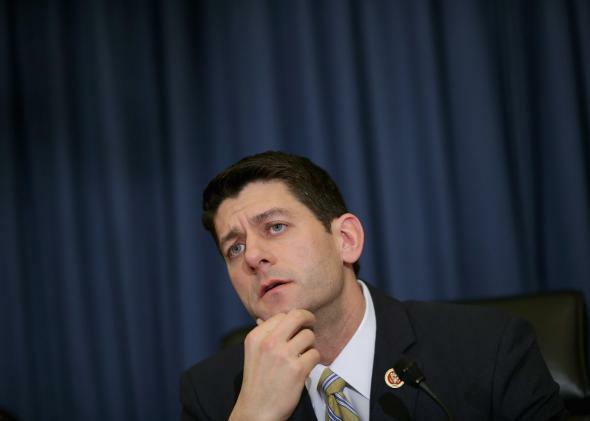 Paul Ryan, pictured at a hearing in February 2014, contemplating a tax cut for America’s heirs and heiresses? Wednesday afternoon, the Paul Ryan–led House Ways and Means Committee plans to make a statement of solidarity with America’s wealthy young socialites by voting on a bill to eliminate the estate tax. While mostly symbolic at this point, it’s another small and useful reminder that the Republican Party is nothing if not dedicated to making sure millionaires pay the absolute minimum amount of money to the IRS. And truly, we’re just talking about millionaires at this point. Currently, the government only taxes estates worth $5.43 million in the case of a deceased individual, or $10.86 million for a married couple—which impacts just the richest 0.2 percent of Americans, according to the Center on Budget Policy and Priorities. Fifteen years ago, when the tax kicked in around $675,000 per person, it only affected the wealthy. Now it only affects the super-wealthy. Conservatives would, of course, object to this characterization. Their main knock against the “death tax,” as they like to call it, is that it supposedly discourages saving and investment. The idea is that people have less incentive to keep their money in stocks or bonds if the government is only going to take a huge slice of it once death comes knocking. Beyond that, they claim it creates problems for family-owned businesses and, of course, farms. If a 50-year-old restaurant or cattle ranch doesn’t have enough cash on hand to cover the full tax bill, theoretically heirs can be forced to sell some assets in order to pay the government its cut. How important are these concerns in real life? Not especially. What little research has been done on the subject suggests that higher taxes may shrink estates by a small amount, but as Columbia University economist Wojciech Kopczuk writes, it’s unclear how much of that is because people really save less over the course of their lifetime, or because they just find ways to avoid taxes once they get closer to death. As for the possibility that someone might have to sell off the family farm? That doesn’t seem to happen all too often, either. The Congressional Budget Office found that back in 1999, just 12 percent of farm estates didn’t have enough cash or other liquid assets on hand to pay their tax liability. Given that the tax had a much wider reach then, the fraction is probably even smaller today. Even when families do have to pay the estate tax, the reality is that the bite isn’t necessarily that large. The top statutory rate is 40 percent, yes. But thanks to exemptions, the Tax Policy Center estimates that the average effective rate is actually closer to 17 percent. The bottom line is that the estate tax is already much diminished. But slashing it would still cost the government about $268 billion over 10 years. Which, again, would be a nice gift to the top 0.2 percent.